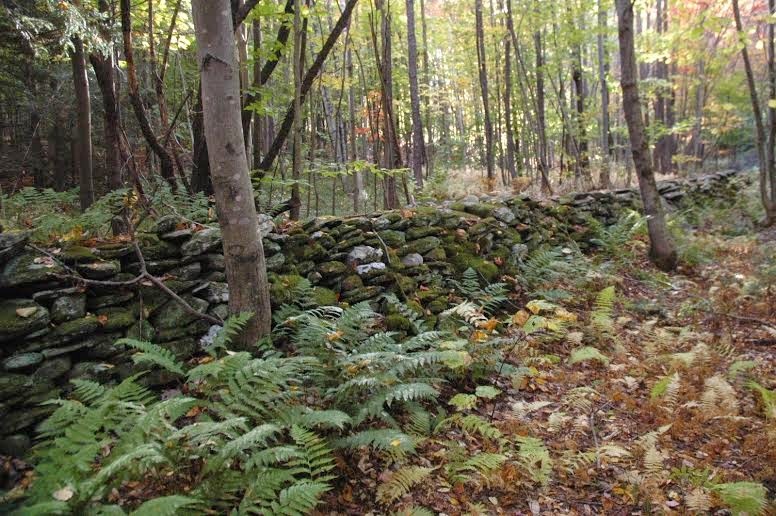 A tiny graveyard on the western slope of Lebanon Mountain, tucked away just off Route 20 in Bates Memorial State Park, remains as a very obscure local reminder of the legacy of the Bates family for whom the park is named, and a physical window into the curious story of the mammoth obelisk that very nearly got built there. It contains only a few simple headstones, clustered around a six foot tall granite cross marking the grave of Lindon W. Bates Jr. The cross bears the inscription Le vrai caractere perce toujours dans le grandes circonstances, true character always shows through in great circumstances. Most of the standard local histories that I own or have perused have little of significance to say about the Bates family history. One of my staple reference tomes, Clay Perrys New Englands Buried Treasure (1946), spares a tiny passage describing the Bates family ghost house, near which the family began constructing a monument to their perished son, and from which, it is said, they rose suddenly from the dinner table one night and fled the place forever, leaving their belongings and never offering an explanation. To someone of my peculiar bent, such an off-hand morsel seems designed to tantalize the reader into a state of absolutely insufferable curiosity. Was there any relationship between this story and the old legend of a devil exorcised years earlier by the nearby Shakers, I wondered? What I found upon closer examination was better than another local haunted house yarn- in the true roots of that tiny plot is a storybook saga that stands as emblematic of an entire chapter in American history. The Bates family first purchased 800 acres of land from the Shakers, building a summer villa named Lebanon Lodge between the Hancock and New Lebanon Shaker communities. Times had been good for Lindon Bates Sr.; Bates Engineering and Construction Company was a profit-generating giant even before they were contracted for the Panama Canal. He, along with his wife Josephine and his sons, Lindon Jr. and Lindell, were deep in the heart of New York high society, and like many of their peers at the time, decided on the Berkshires for the location of a part time estate. Unlike many of the monumentally wealthy families who took up residence in the area in the Gilded Age, though, they seem to have actually been happy, morally decent people, with no apparent skeletons in their closet. Lindon Jr. in particular seems to have lead an almost storybook life of exemplary kindness, courage and generosity, the kind of tale that would be too cheesy to believe in fiction, or perhaps at all, if it werent so well documented. He had been instilled at an early age with a real concept of noblesse oblige, the sense of ones wealth being a matter of providence, and the belief that the individual lucky enough to acquire wealth has a grave duty to those less fortunate, and must act honorably and generously at all times. Until recently, I had thought the rumored existence of such an inclination among members of the extremely wealthy class could safely be relegated to the domain of fairy tale and propaganda. Perhaps this conclusion was premature. Lindons future seemed bright from a young age. After graduating Harrow School in England, he took up studies at Yale at the age of 12, graduating top of his class in 1902 with a degree in Civil Engineering, accolades in sports, sciences, and fluency in a plethora of languages. He explored and traveled extensively, covering the Nile, the Amazon, Siberia and Mongolia among other exotic locales, meanwhile writing four books and numerous articles. Nonetheless, more than once he stated that some of his happiest times took place at Lebanon Lodge, hiking and admiring the extraordinary views of the Housatonic valley from atop Richmond Peak. He became involved in politics early, rising up in Republican party while campaigning for Teddy Roosevelt. He served two terms in the New York legislature, where he pushed and steadily forged support for a rigorous progressive platform, getting legislation passed for Workmans Compensation, civil service merit systems, and various kinds of aid for widows and the unemployed. One of his political associates wrote of him, One of his most striking characteristics was his indifference to opinion. He wanted the right thing done and did not care whether he or someone else did it. By twenty-five, some were already looking to him as a possible future President. When War erupted in Europe in 1914, Lindon dedicated himself to organizing a massive relief effort, marshalling millions of dollars in food and financial aid to Belgium. The King of Belgium eventually awarded him with the Belgian cross for his philanthropic labors on behalf of their nation. In the spring of 1915, Lindon was also desperately needed to supervise the raising of the Galveston flood plain, a massive undertaking. Hence, when the Belgian government asked him to come manage food distribution throughout their country, Lindon Bates Sr. pleaded with him to put off the trip. The Belgian Embassy also continued to plead, and with hardly any time spent pondering, he left New York on the S.S. Lusitania on May 2. Six days later, the world was stunned by the headlines: the Lusitania had been torpedoed by a German U-Boat in the North Sea. An unexpected second explosion (said by some to have been caused by munitions that were secretly carried onboard) occurred immediately, and the ship sank within twenty minutes time. Twelve hundred civilians were killed. Lindons body was not immediately accounted for, but his last moments had already been pieced together by the testimony of survivors. When the torpedo struck, he was on deck conversing with another passenger, Amy Pearl. He left her with her husband and set out into the melee to locate her children. Another witness reported seeing him take off his life preserver and put it on a hysterical elderly woman, getting her on one of the last boats launched. He was last seen heading back below deck. His body washed up 230 miles from the wreck two and a half months later. An enormous funeral took place in New York, with condolences from Roosevelt, and eulogies by Ogden Mills, future first lady Lou Henry Hoover, and many others. One such eulogy reads: Thus it stands forever. The bravest are the tenderest; the loving are the daring. Lindon Wallace Bates. Son of America. Friend of the helpless and destitute. The life that he lived and the death that he died endure in the judgment of an unforgetting God. Later, privately, his younger brother Lindell brought his remains home, interring them in a temporary crypt carved out of the bedrock near his beloved Lebanon Lodge. His parents commissioned architect Donne Barber to design an enormous monument, to Lindon Jr. and to all the Lusitania victims, to be built on their property. The structure he designed, drawings of which still exist, was to be a 130 foot tall granite obelisk replicating Pompeiis Pillar in Alexandria. It was to be spot lit on three sides, and the lights would remain on forever. The loss of their eldest son had hit the Bates family hard, though. Josephine remained depressed the rest of her life. Lindon Sr. dumped abnormally high amounts of the family fortune into research on ship camouflage. Then the United States entered the Great War, and the noble ideals of an entire generation were slaughtered, their bright hopes for a better world dying off in the gunfire and mustard gas. The Bates family never really recovered, and plans for the massive Monument did not survive the times- nor, some would say, did any real sense of noblesse oblige in this country. Lindell fenced off the tiny plot where Lindons humble cross now stands. Lindon Sr. was buried there in 1924, Josephine in 1934, Lindell in 1937. In 1954, Lindon Sr.s sister Mary Wallace Bates, whose life story is an interesting tale in its own right, became the last person interred there. Lindell bequeathed the remaining acres to Pittsfield upon his death, about half of which remain as public park land today. Aside from these few small graves, no trace of Lebanon Lodge, its supposed ghost house, or the envisioned Monument to Sacrifice remains only a half-remembered fairy tale about a distant time, when a very few individuals believed that they had both the means and the will to transform the world into a better place. Joe Durwin is a Pittsfield native currently on sabbatical in the desert. Send oddball rumors, crackpot theories, bizarre gossip, and accounts of the strange to joe@durwin.net or write to him care of the Advocate. Do any photos exist of Lindon Wallace Bates Senior? This is a terrific Historical content story about a family I knew nothing of in the area I grew up in. It is very well written and delightful. I look forward to reading more from this writer. I'm an avid hunter and outdoorsman that has been hunting/hiking up there for the better part of a decade. I've never heard the story and always was intrigued by the fenced off gravesite.